Middlebury College integrates sustainability into all facets of its academics, operations, and planning. The College promotes an everyday sustainability ethic, transforming the campus into a learning laboratory for environmental thinking, projects, and collaborations. 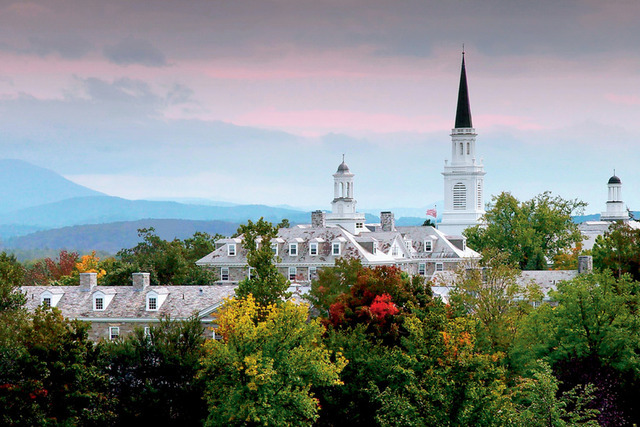 Middlebury College is on track to achieve carbon neutrality by 2016. The College's biomass plant, installed in 2009, eliminated the use of more than one million gallons of high carbon #6 fuel oil. Middlebury College is committed to having 30 percent real food in the dining halls by 2016. Real food is defined as being grown locally within 150 miles, raised humanely, grown using ecological practices, and/or fair trade. Students are currently researching the feasibility of expanding our goal to 50 percent real food by 2020. Thanks to a generous donation by Middlebury College trustee Louis Bacon '79, approximately 2,100 acres of college lands at Bread Loaf will be conserved, protected, and properly managed in perpetuity. Over 60 percent of Middlebury College's waste is diverted from the landfill thanks to our innovative composting and recycling programs. All new buildings on Middlebury College's campus must be designed and constructed to meet, at minimum, LEED silver standards. Currently there are three LEED platinum buildings on campus, the Squash Center, the Franklin Environmental Center at Hillcrest, and the InSite house. The newly constructed Field House received LEED Gold certification in 2016. Contact the Office of Sustainability Integration at sustainability@middlebury.edu for more information.